The snowy owl is one of the predator kings of the arctic tundra. Few studies have been made of these birds because they live where we can’t survive for much of the year This is a profound revelation when you think about it. Snowy owls are built for winter with extremely thick insulating feathers; large tufts of feathers surround their beaks and serve to warm the frigid air before they breathe it into their lungs. They have telescopic eyes perfect for long-distance vision and very sensitive to low-light conditions of the polar night. Mature snowy owls stand about 2 feet tall, weigh around 5 pounds, and have a 5-foot wingspan. They are ground nesters and dwellers because there are no trees on the tundra. They take off from the ground and hunt while flying. This maneuver requires enormous strength, helped by massive wings in proportion to their body weight. Lengths of day and night vary with location in the arctic. The closer one is to the North Pole, the longer the night in winter and the longer the day in summer. Right at the pole night lasts 6 months and day lasts 6 months. Therefore, snowy owlets must mature very fast due to the short length of the arctic summer. They need to hatch, grow up, learn to fly, and learn to hunt in just a few months. Their main food in summer is brown lemmings, the population of which rises and falls in any given year. So, too, the number of snowy owlets rises and falls with the lemming population. Our Chance to See Them! The arctic winter is extremely harsh, too brutal for young snowy owls, so they migrate to the great plains of Canada and the US where they perfect their flying and hunting skills. They migrate back to the arctic in the spring. Snowy owls are often seen in the American Midwest, along Long Island Sound, and other places where the topography is similar to their tundra and northern seacoast habitat. Survival is much easier when temperatures are warmer and prey is easy to find. Mistakes are not fatal and they can learn the skills necessary to endure winter in the arctic. They are an exciting visitor to the US, though rarely seen here in Colorado and then only on the eastern plains. I designed “The King of Winter” to invoke a feeling of wind-sculpted snow. There is little anatomy to the forms in this stone sculpture, which rely on the play of light and shadow to be seen and understood. The stone is pure white Sivec (sa-VETCH) marble from Macedonia. I sanded it to a very low grit (120) to preserve the gorgeous crystal, which sparkles like new snow. Each time I carve this stone I attempt to get closer and closer to sculpting like the wind—sweeping shapes with less definition. This is an exciting evolution for me and I know I will carve more winter animals from Sivec. 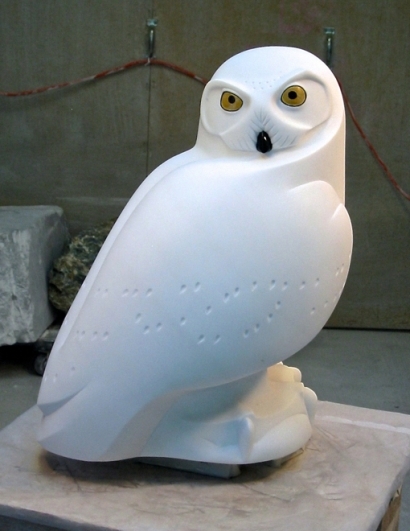 The eyes and beak are inlaid marble. I used exterior epoxy to anchor them–a German product called Akemi. This epoxy is used in the repair of cathedral facades and is harder than the stone. The King of Winter is made for outdoor display and I am excited to see it with snow drifted around. 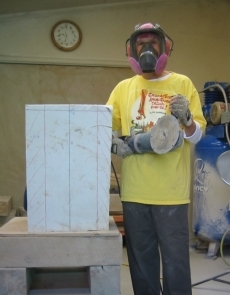 It has been several years since I carved a large block. This one started at 660 pounds and was carved down to about 400 pounds, my largest block to date. The stone was impossible for me to move by myself once it was hoisted onto the carving stand. 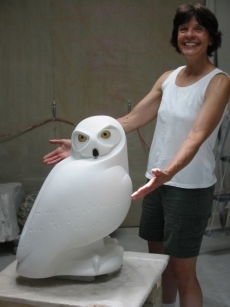 My husband, Brian, deserves huge thanks for all the turning, tipping and standing up we did as the stone became the owl. Even in the final sanding stage, the lightest the sculpture will ever get, I was not able to tip it down and stand it up by myself. It is surprising what one can do to move heavy stones around, but this piece required much strength along with all the wooden blocks, sand bags, and physics. Carving is a meditative process for me, along with being a physical workout and a lot of fun. I love thinking about the subject I am sculpting for the months it takes to complete a piece. The feel of stone as a rough block and as a finely shaped and sanded form is most satisfying. I love that it is a piece of the earth created by the heats, pressures, and serendipity of nature. Fun to do, fun to think about, fun to look at—yep, I’m happy.